What Does Code P0340 Mean? A properly running engine is essentially the precise timing of gasoline-fueled explosions. Depending on engine speed (RPM) and load the engine control unit (ECU) controls the timing and amount of fuel injection, timing of spark ignition, and in the case of engines with variable valve timing (VVT), intake- and exhaust-valve timing adjustments. The two main timing and position sensors used by the ECU are the crankshaft position sensor (often CKP) and camshaft position sensor (often CMP). If there are two banks on a VVT-equipped engine, then there will be two camshaft position sensors. The camshaft position sensor reacts to a toothed wheel on the camshaft, which gives the ECU constant information on its speed and position. Of course, the CMP is located on the engine, usually somewhere on the cylinder head, so it transmits CMP data to the ECU using wires. If the ECU cannot detect a CMP signal, it will set DTC P0340 or DTC P0345 – Camshaft Position Sensor Circuit Malfunction. If your engine has only one CMP, such as an inline-four-cylinder, the only CMP code available is for Bank 1, P0340. On the other hand, V6 or V8 engines have two banks, Bank 1 and Bank 2, and would therefore have two CMPs, so DTC P0345 would refer to Bank 2. Sensor A indicates that the malfunction is occurring with the camshaft position sensor circuit that pertains to the intake camshaft. Sensor B codes pertain to the exhaust camshaft. What are the common causes of code P0340? Depending on year, make, and model, DTC P0340 or P0345 may have number of causes. Here are some of the most common. 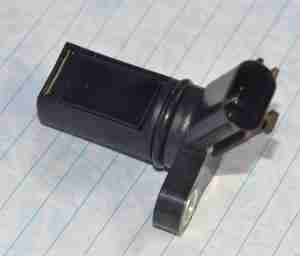 Faulty Sensor – If the sensor coil is open or shorted, then it will generate no signal. Poor Installation – A good CMP signal is highly dependent on placement. Generally, the sensor needs between 0.020” and 0.050” clearance to the reluctor ring or camshaft tooth. If the sensor is cocked to one side or not firmly seated, the clearance will be wrong and the signal will be too weak for the ECU to detect. If the reluctor ring is rubbing on the sensor, the signal will be distorted. Ford Trucks / Mustang GT – An alternator phase problem, such as a blown diode or open coil, may cause so much electrical interference that the CMP signal gets distorted, causing a P0340 / P0345 DTC to set, among others, in spite of there being no actual problem with the CMP sensor or wiring. Cars in Storage – If your car has been in storage for any length of time, rodents may find it a great nesting place. Unfortunately, while looking for nesting materials and cleaning house, these little critters might find your wiring offensive or even tasty, resulting in open circuit problems. Older Cars – Over time, plastic and rubber tends to become brittle and less flexible, which can lead to connector breakage and wire insulation damage. In turn, this may cause corrosion, open circuits, or short circuits. 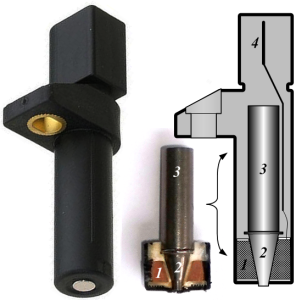 Generally, the camshaft position sensor is pretty resilient and long-lived, which doesn’t necessary rule it out as a problem, but most of the time, the problem lies in the wiring and connectors for the sensor, or something else entirely. Before you just jump right on a new sensor, make sure you can rule out the rest of the system, first. What are the symptoms of code P0340? Because the CMP signal is so critical to ignition and fuel injection, you may experience a no-start or start-stall condition. Some vehicle ECUs may be able to use the CKP signal to estimate camshaft position, so the engine will run, but may experience hard starting, rough running, misfiring, or poor acceleration. How do you troubleshoot code P0340? Because P0340 and P0345 refer to a circuit problem, do not automatically condemn the CMP sensor. That’s not to say that it might not be the sensor itself, but replacing the sensor is not always going to fix the problem. Go to All Data DIY or other source and get out your wiring diagram and DVOM (digital volt-ohm meter) for this next part. Visual Inspection – At the CMP sensor, make sure it is plugged in and firmly seated. Also, follow the wiring harness to look for damage, such as from recent engine repairs, aftermarket installations, impact damage, or rodent damage. Resistance Check – Disconnect the sensor and measure resistance. An open-circuit, ∞ Ω, or short-circuit, 0 Ω, at this point would tell you that the sensor itself is at fault. Signal Check – The proper way to do this would be with a digital oscilloscope, but you can get a rough estimation of CMP sensor function by putting your DVOM in AC V mode. When cranking, you should be able to see at least 20 mV. Electrical Inspection – Disconnect the ECM and CMP connectors, and put a short pin across the terminals of the CMP connection. You can use a small paperclip or wire for this. From the ECM side, check for resistance in the circuit itself. With the short pin in place, you should read less than 0.1 Ω. Any higher, and the ECU will be unable to detect the signal. Look for a broken wire or corrosion somewhere in the circuit. Remove the short pin and check for open circuit, ∞ Ω. If there is some amount of resistance, suspect a short circuit. Water in an intermediary connector could easily be the cause of a short-circuit. Check for short-to-ground by taking one of the leads and connecting it to body-ground or the negative battery terminal. You should read an open circuit, ∞ Ω. Any unintentional connection to ground could distort or weaken the signal. Other Problems – In case no problems can be found in the CMP sensor or its wiring, it may be that P0340 or P0345 are simply auxiliary fault codes. A jumped timing belt, faulty crankshaft position sensor signal or circuit, or engine misfire, may be the primary problem. Double check these before coming back to the CMP. DTC P0340 or P0345 may be accompanied by other DTCs, such as P0300 Random Misfire, P0725 Engine Speed Sensor Circuit, or P0335 Crankshaft Position Sensor Circuit Malfunction. 96 Subaru Outback Legacy Code P0340?? Concerning the “position plate” that fires the CMP: are its “teeth” simply steel, or are they magnetized? Does the CMP fire just on proximate steel, or does it require a magnet to fire it? To answer your question, the toothed wheel is not magnetised, just steel. The sensor itself is magnetic, and as the tooth passes the sensor, it effects a change in the magnetic field. This change is what the sensor detects, sending a signal back to the ECM. My Nissan quest 2006 it does not start what can be ? I hava be change camshaft position. Senson bank 2 y the problem continue, help me is possible. I am driving Renault megane2.sometimes no power.it just stall,when i check p0340.after it loose power.I stop 4 few minutes then it goes.what might be problem. pls help. I have a 2005 Dodge Grand Caravan that won’t start. Going up the interstate it overheated and shut down. I have replaced the leaking radiator with a new one. I have replaced the starter and the camshaft position sensor and still not starting. The error codes continue to read the camshaft position sensor being the problem. The starter sounds like it is just spinning and not engaging. I am lost now. Please give me some direction.